Anxious to leave the Spanish Civil War behind, a group of filmmakers from Spain travel to Nazi Germany to film a musical drama set in Andalucia. 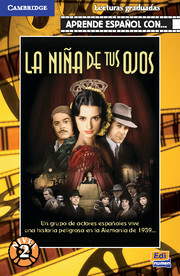 From the reader series Aprende Español Con…, which features stories based on modern films and television series, carefully adapted for Spanish language students. Includes an Audio CD of the text, supplementary materials for teachers, and before and after activities for students.